CBD's amazing healing properties are being rediscovered as a remedy for many ailments. 24 500 shekels of cassia—all according to the sanctuary shekel—and a hin of olive oil. In 1936, Sula Benet, a Polish etymologist from the Institute of Anthropological Sciences in Warsaw revealed solid evidence of the Hebrew use of cannabis. The word “cannabis had previously been thought to be of Scythian origin as Scythians first brought the plant to Europe, but Benet showed it has much earlier origin in Semitic languages like Hebrew. “In the original Hebrew text of the Old Testament there are references to hemp, both as incense, which was an integral part of religious celebration, and as an intoxicant.” Benet demonstrated that the word for cannabis is “kaneh-bosm”, and in traditional Hebrew “kaneh” or “kannabus.” The root “kan” here means “reed” or “hemp”, while “bosm” means “aromatic.” This word appears five times in the Old Testament (Exodus, Song of Solomon, Isaiah, Jeremiah, and Ezekiel) and has been mistranslated as “calamus”, a common marsh plant with little monetary value that does not have the qualities or value ascribed to “kaneh-bosm.” The error occurred in the oldest Greek translation of the Hebrew bible, the Septuagint in the 3rd century BC, and was repeated in translations that followed. For Cannabis I use 99% Pure CBD Crystal isolate made from hemp. That means this is THC free. Since THC is still illegal to ship currently this is the next best thing. I use Ceylon Cinnamon which is more medicinal than the normal cinnamon we use in cooking called Cassia. The Myrrh and Olive Oil is also of the finest quality I could find as well. To make this I crushed up the cinnamon, and myrrh into a powder with my Mortar and Pestle and added them to the Olive Oil. I let it cook on the lowest heat for a given amount of time until all the goodness is cooked into the oil. Then I filtered out the remains. After that I preformed the Ormus Live Method by adding Dead Sea Salt and Sea 90 to the oil and letting it sit in a M.E.O.W Kettle for 3 more days. I would shake it up every once and a while and then finally I filtered out the salt. Finally I added the CBD crystals that I also crushed into a fine powder. 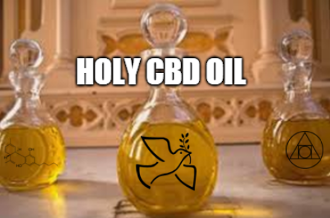 That makes one potent healing oil full of goodies.